A scissor lift is used to elevate workers to high areas, and they are most commonly used in manufacturing and industrial settings. These particular lifts are supported by crisscrossing braces that extend upward. Most scissor lifts are designed to move only up and down. However; some are able to move a few feet horizontally. One of the greatest advantages to scissor lifts is that they feature large platforms that can fit several people at once (along with materials). There are a few pros with scissor lifts which include a larger platform and they are cheaper than the boom or aerial lift. 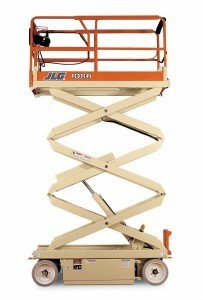 Scissor lifts are awesome for those jobs that need multiple workers to work at an elevated level. The size of the platform tends to be much larger than with other types of aerial lifts. To read more about scissor lifts vs. aerial lifts click here and read about it on our blog!